Angophora costata or ‘Smooth-Barked Apple’. Not an apple tree at all but a large evergreen tree with dense foliage with a broad domed crown. Very attractive smooth and heavily patterned new pink bark is an attraction. With common names including ‘Sydney Red Gum’ and ‘Apple Myrtle’ . Angophora costata is found widely in Southern Queensland and coastal NSW. A versatile evergreen tree Angophora costata will usually reach around 10m in cultivation. Available in a number of sizes from listed wholesale growers. 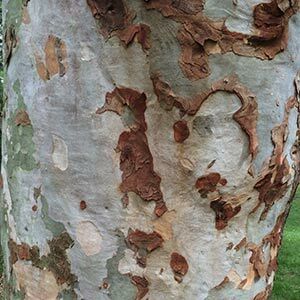 Creamy flowers in summer and attractive bark are added attractions to this versatile tree. Pictured right the specimen is around 100 years old. 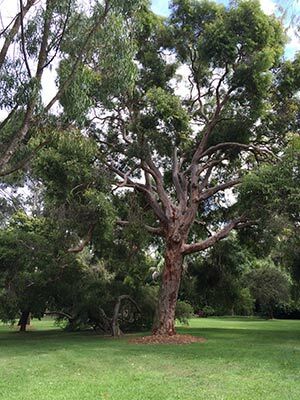 Although tolerant of a range of conditions including part shade to full sun, Angophora costata does require a well drained soil. Used below power line and easily pruned this is a disease resistant tree that has few problems. Subject to dropping limbs in times of drought and high winds, carefully selected and pruned specimens cope a lot better with conditions. Angophera are a little frost tender when grown from tube stock, so protect by using a tree guard. Although originally from Coastal QLD this useful landscaping tree grows well from Queensland through to Victoria. Used widely in street plantings, parks and gardens as well as around commercial and industrial developments. Height – To around 10m. Spread – Crown to around 4 – 5m. Frost tolerant – Once established, will need protection when young. Soil – Tolerant of most soils, however will not grow in waterlogged soils.